Lugging home 60 lbs of tomatoes from my parent’s garden in an oversize Olive Garden paper bag (double bagged) seemed like a great idea at the time. My parent’s 40 tomato plants were overflowing and they didn’t have the energy to deal with all of the fruit. Happily, my Mom helped me load up all I could possibly carry. However, when I got off the Monday morning train in Chicago, I could hardly carry the bag outside to a taxi. I pride myself on my strength but I had to keep taking small breaks every couple feet. Even Ira, who came to meet me at the station found it hard to muscle the bag, needing to wrap a shirt around his hand to protect his palms from being torn into by the string handles. Why am I going into so much detail about the weight? If we had a hard time carrying this thing, imagine what the layers of delicate tomatoes at the bottom of the bag where like when I unloaded them. Total smoosh. 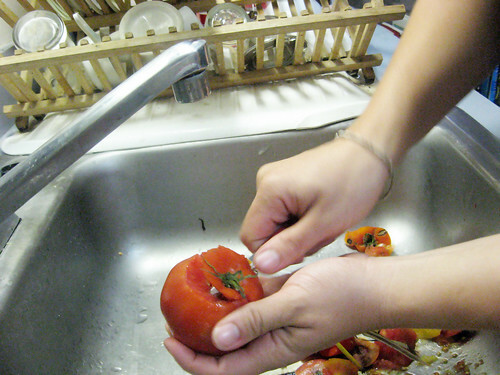 Half of the tomatoes needed to be dealt with immediately or be thrown away. I was super tired from having to be up at 6 a.m. to get the morning train back to Chicago; all I wanted to do was take a nice hot bath and take a nap. My 40 hour work week was beginning the next day, and I knew I wouldn’t have time until Saturday to take care of them. What to do? 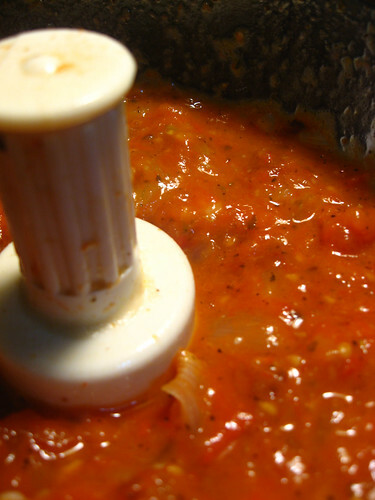 A quick solution: Roasted Marinara! I decided to slow roast the crushed tomatoes with some garlic and spices in the oven over low heat. 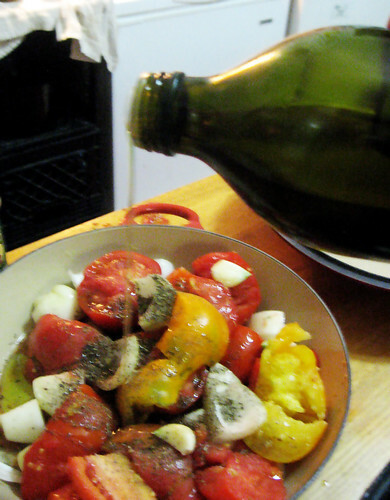 This way, after the prep work, I could just throw the tomato mixture in the oven and forget about if for a while. You don’t need to stir it or anything. Super easy! I went through and separated the tomatoes into piles of the ones which were crushed and the ones were OK enough to last through the week. 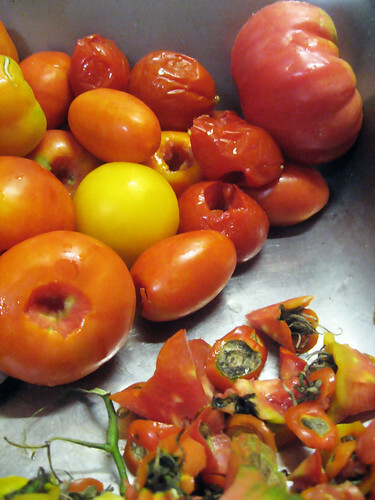 Using a paring knife, I cored the tomatoes removing the stems, rotten and bruised areas, and cutting the larger tomatoes in half. 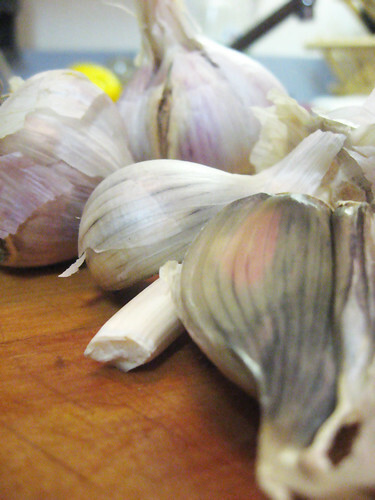 I didn’t have any fresh herbs on hand, so a bit of dried thyme, rosemary, and oregano was added along with some delicious cloves of garlic given to us by Ira’s Mom. Adding some kosher salt, pepper and a bit of olive oil, this stuff was ready for the oven. I set the stove for 250 degrees and put it in the oven in my new birthday present. 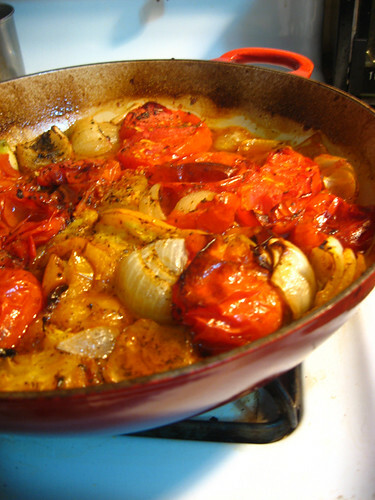 By cooking at a low temp, the sugars of the tomatoes are really emphasized and the flavors of all the ingredients fuse beautifully. Best of all, I could go take my bath and nap, knowing this would be fine in the oven for at least 2 or 3 hours. I woke up, well rested, with my roasted tomatoes all ready to be taken out of the oven. After letting them cool for a bit, I gently pulsed them in the food processor and viola, ROASTED MARINARA! 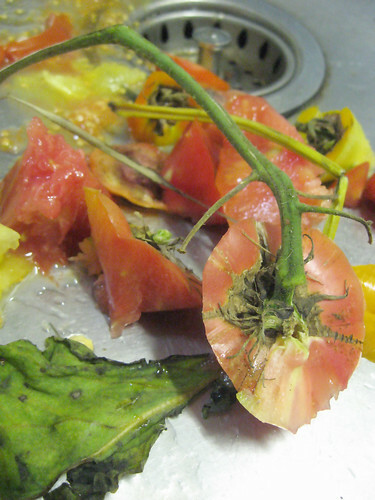 Here is a photo set of a roasted marinara I did earlier last spring salvaging tomatoes starting to get moldy. I love roasting marinara! 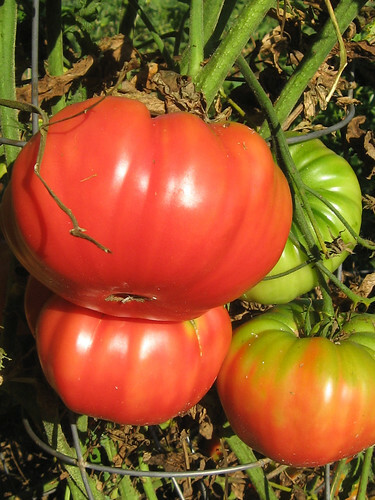 Brandywines = best tomato ever. How do you store your sauce? I can it. 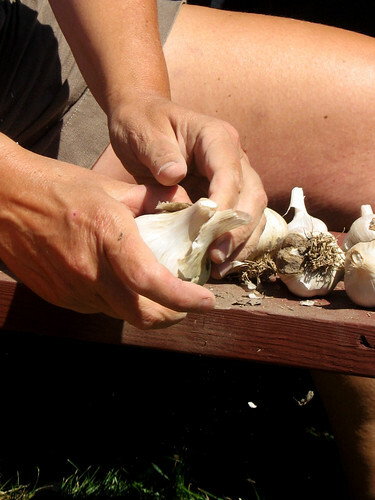 I meant to blog about it last summer but ran out of time. Expect to see some canning posts soon!